Despite just being inaugurated January 20th, President Trump has his fingerprints all over this. The January jobs numbers have been released. The United States gained 5,000 manufacturing jobs during the first month of 2017. During the same time they lost 10,000 government jobs. This is according to statistics that were released by the Bureau of Labor Statistics. 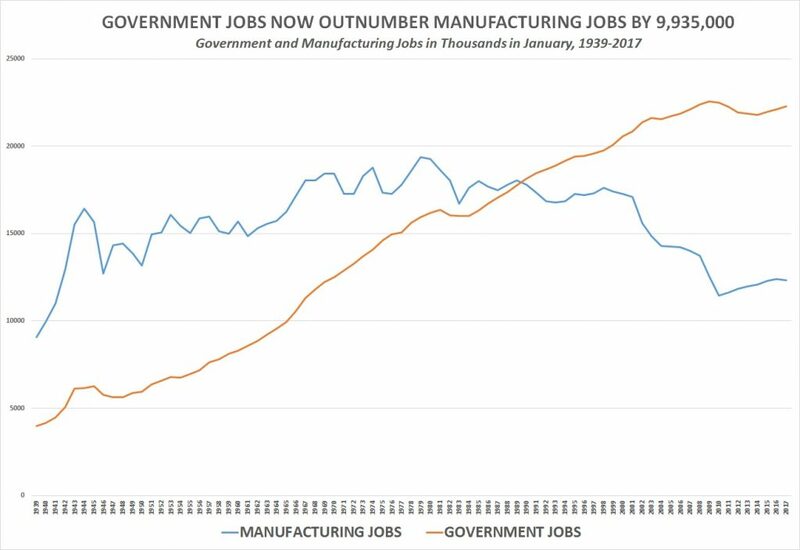 Currently, government jobs outnumbers jobs in manufacturing. As of December the margin was 9,950,000. This number has now been released to 9,935,000. From January 2016 to January 2017 there were 162,000 government jobs added and 46,000 manufacturing jobs were lost. These statistics were provided by a report from the Bureau of Labor Statistics. The image below shows the history of government and manufacturing jobs in the United States since 1939. While this is a good indicator that President Trump has things going in the direction he had hoped, it is too early to tell how substantial this report is. Over the next 2 to 3 months there will be a much greater indication of how much government jobs and spending are being cut. Trump is hard at work, meeting with business leaders in hopes of adding more jobs. He had this to say on Twitter. After the January jobs report was made public, the Dow finished the day at over 20000. Also contributing to this was the report that President Trump will roll back some of the post-crisis financial regulations.